BENGALURU (Oct 31): Southeast Asian stock markets were subdued on Monday, as oil prices fell and uncertainty prevailed ahead of the U.S. presidential election, while a better-than-expected third-quarter growth in U.S. economy improved the possibility of an interest rate hike. Federal investigators' new probe related to the email use of Democratic presidential nominee Hillary Clinton shook markets' conviction of her victory in the election, as investors tend to see Clinton as the candidate of the status quo. Oil prices continued to fall on Monday after non-OPEC producers made no specific commitment to join OPEC in limiting oil output levels to prop up prices. Weak market trends are expected to unfold today, said Taye Shim, an analyst with Jakarta-based Daewoo Securities, in a note. The third-quarter GDP growth should strengthen the case for a U.S. rate hike by the Federal Reserve, said Shim, adding that the fall in oil prices and FBI's investigation into Clinton's emails should negatively impact the market. Thailand was flat as investors shrugged off data showing unexpected rise in the factory output for the second straight month. Gains in financials and industrials were offset by declines in energy and consumer discretionary stocks. Kasikornbank PCL was up more than 0.5%, while Thailand's top energy firm PTT Pcl fell as much as 1.4% to its lowest in nearly three weeks. Thailand's balance of trade numbers are expected later in the day. 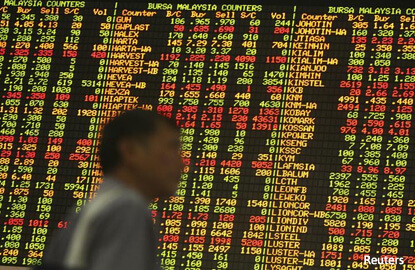 Singapore stocks were lower, dragged down by financials and consumer discretionary stocks. Investment holding company Comfortdelgro Corp Ltd fell as much as 5.8% to its lowest in two years. Oversea-Chinese Banking Corp extended losses for a second session to fall more than 1% to a two-week low. Philippines is closed today for a holiday.